There are two maps that determine how land can be used in Bend: the Comprehensive Plan and the Zoning Map. Over the years, some differences have accumulated between the two. Ordinarily, the differences are adjusted in a process involving hearings for each parcel in question. Bend is attempting to modernize its maps and align the two plans in one large initiative. This can save time and money for all involved, but reduces opportunities for public comment to this one event. Several areas within the Old Farm District will be affected. 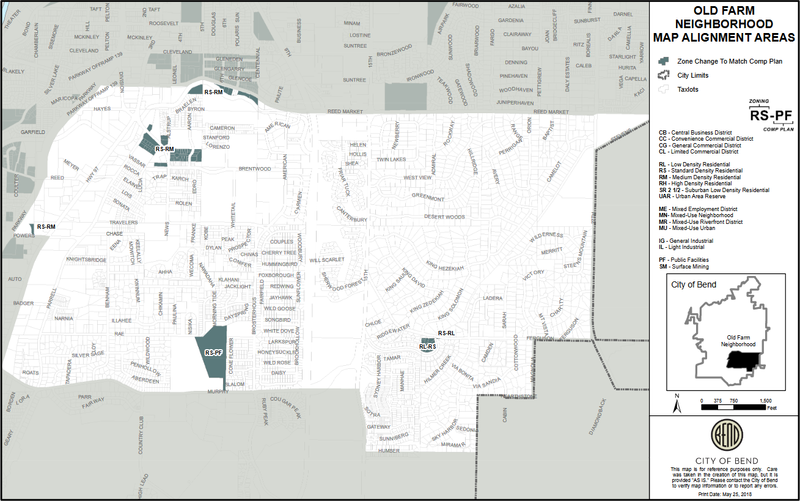 View the map below for details or visit the City website to see plans citywide. An Open House will be held at the BPRD building at 799 SW Columbia Street on July 12th starting at 5:30pm. Small group presentations providing an overview of the project will begin at 5:45pm and be held every 30 minutes until 7:15pm. Visit bendoregon.gov/mapalignmentproject to learn more about the project.